The BCR2 is used in the PS2, three volt system. 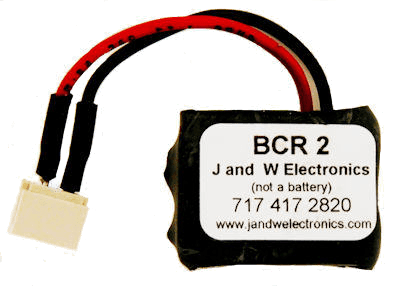 If your PS2 engine uses a battery pack with two AA batteries, in a blue plastic wrap, or two AAA batteries in a green plastic wrap or your engine has been upgraded to PS2, you can now replace that battery with the BCR 2. Check your instruction to see if the PS2 engine uses a three volt or the instruction say: 2.4 volt battery. The BCR 2 is a permanent replacement for the battery and plugs into the battery connector. Power up your engine in neutral at ten volts or more for one minute, and the engine will be ready to run regardless of how long the engine has been sitting. When the BCR 2 needs to be charged, the sound volume will be lower than normal. While the BCR 2 is charging up, the sound level will return to normal. You'll still need to wait one full minute for the BCR 2 to fully charge; then your engine will be ready to run. In Command mode, run your engine for one minute, and the BCR 2 will be charged. The BCR 2 will hold a charge for over a week after turning the power off to the engine! If you run your engine at least once a week, you will never have to wait to charge up the BCR 2. At anytime the sound level is lower than normal, the BCR 2 will need to be charged.